Le Vieux Chene is found in the rolling wooded hills of the Tarn and Garonne close to the popular and attractive medieval town of Beaumont-de-Lomagne. The recently renovated 400 year old farmhouse is situated amongst beautiful oak woods with a superb view of the surrounding hills. Although quiet and secluded, it is within easy reach of many local attractions and places of interest such as Toulouse, the Mediterranean and Atlantic Coasts, Carcassonne, the magnificent Pyrenees, and many more. “A warm welcome, very comfortable rooms with great food in a lovely setting. Excellent base for exploring the area." "What an excellent place! Fantastic surroundings, food, and company! Better than any hotel so far! Will highly recommend to all our friends!" Experience the real France and get away from the rush and the pressures of everyday life in the relaxing surroundings of the French countryside. You will receive a warm welcome when you arrive at Le Vieux Chene and will enjoy the comfort of well- appointed rooms, good food and wine, with the freedom to come and go as you please. Le Vieux Chene is 5 kilometres east of Beaumont De Lomagne just off the D928 - and 25 minutes drive west of Montauban. 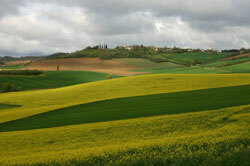 We are 40 minutes drive from Toulouse airport. The Mediterranean is 2 hours drive away and Andorra or Biarritz are only 2 1/2 hours drive away. Mark and Merryn bought the farmhouse in 2002 and spent 3 years restoring the property to its former rustic self. Mark is a qualified chef, and Merryn's background includes interior design. 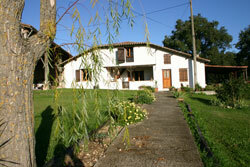 Both look forward to providing you with the true hospitality of their French farmhouse.